Unless a nation’s life faces peril, war is murder. Every man can follow his own conscience, provided it does not interfere with sane reason or bid him against the liberty of his fellow-men. We must delve into our roots and reconstruct what history has divided. We can’t wait for them to approach us. We must reach out to them. Mankind is a single body and each nation a part of that body. It is claimed that religious unity is also a factor in the formation of nations. Whereas, we see the contrary in the Turkish nation. Turks were a great nation even before they adopted Islam. This religion did not help the Arabs, Iranians, Egyptians and others to unite with Turks to form a nation. Conversely, it weakened the Turks’ national relations; it numbed Turkish national feelings and enthusiasm. This was natural, because Mohammedanism was based on Arab nationalism above all nationalities. Religion is an important institution. A nation without religion cannot survive. Yet it is also very important to note that religion is a link between Allah and the individual believer. The brokerage of the pious cannot be permitted. Those who use religion for their own benefit are detestable. We are against such a situation and will not allow it. Those who use religion in such a manner have fooled our people; it is against just such people that we have fought and will continue to fight. Know that whatever conforms to reason, logic, and the advantages and needs of our people conforms equally to Islam. If our religion did not conform to reason and logic, it would not be the perfect religion, the final religion. The foundation of our religion is very strong. The material is strong as well, but the building itself was neglected for hundreds of years. As the plaster dropped down, none thought to replace it and none felt the need to reinforce the building. Quite the contrary: many foreign elements and interpretations, as well as empty beliefs, came along and damaged it still more. Mankind is a single body and each nation a part of that body. We must never say “What does it matter to me if some part of the world is ailing?” If there is such an illness, we must concern ourselves with it as though we were having that illness. There are two Mustafa Kemals. 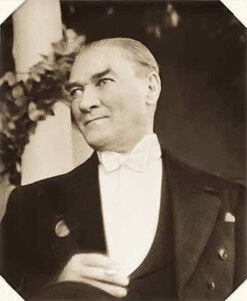 One the flesh-and-blood Mustafa Kemal who now stands before you and who will pass away. The other is you, all of you here who will go to the far corners of our land to spread the ideals which must be defended with your lives if necessary. I stand for the nation’s dreams, and my life’s work is to make them come true. Human kind is made up of two sexes, women and men. Is it possible that a mass is improved by the improvement of only one part and the other part is ignored? Is it possible that if half of a mass is tied to earth with chains and the other half can soar into skies? The government’s most creative and significant duty is education. We shall make the expansion and rise of Turkish culture in every era the mainstay of the Republic. Mankind is a single body and each nation a part of that body. We must never say, “What does it matter to me if some part of the world is ailing?” If there is such an illness, we must concern ourselves with it as though we were having that illness. This nation has never lived without independence. We cannot and shall not live without it. Either independence or death. We must liberate our concepts of justice, our laws and legal institutions from the bonds which hold a tight grip on us although they are incompatible with the needs of our century.